Certain bands release a single high-quality output only to became a pale self-copycat on the sequels, whereas others can release the same album time and time again and still maintain a high quality. 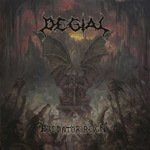 In the field of retro-worshipping death metal, Degial is perhaps the most reliable act of the latter category. As with 'Death's Striking Wings' and 'Savage Mutiny', 'Predator Reign' is filled with quality old-school death metal in the vein of Morbid Angel and Repugnant, with classic screaming growls and a dash of thrash metal. The sound stems from a time when the extreme metal genres had not yet fully branched, but has an unmistakable modern touch. The production is a bit too neat for this to pass as a lost gem from the late 80's, but on the other hand it brings out all the components well and is comparably moderate by modern standards. The main appeal of Degial, compared to other retro-sounding acts, never were and still is not a supreme sense of songwriting or technical escapades, but a truly dark feeling unfortunately lost in many extreme metal acts today. Those genuine feelings of darkness and unease that contributed to the greatness of albums such as 'Altars of Madness' and 'Like an Everflowing Stream', were perfectly captured on Degial's first two albums and 'Predator Reign' shows no sign of a band loosing that touch. Every fan of old-school death metal surely knows the name Degial by now, but in case it passed you unnoticed this along with the rest of the discography is a mandatory listen. As we approach the seasons, there are few better options than Degial for keeping those jolly feelings at bay.